new collaborations are in the pipeline. New recordings: Chapman’s new album ‘50’ was released in January 2017 on the Paradise of Bachelors label. Produced by & featuring Steve Gunn it features his first full band sound for some 20 years. UK tour dates for 2017- www.michaelchapman.co.uk/concerts.htm for detailed listings. 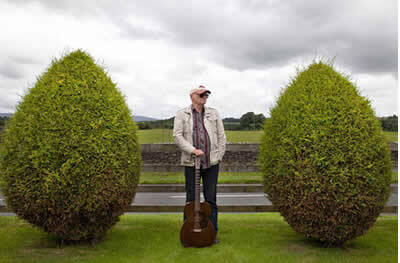 Michael Chapman (born Leeds Yorkshire - 1941) first became known on the London and Cornish folk circuits in 1966. Playing a blend of atmospheric and autobiographical material he established a reputation for intensity and innovation. Signed to EMI's Harvest label he recorded a quartet of classic albums. LPs like 'Rainmaker' and 'Wrecked Again' defined the melancholic observer role Michael was to make his own, mixing intricate guitar instrumentals with a full band sound. His influential album 'Fully Qualified Survivor', featuring the guitar of Mick Ronson (David Bowie) and Rick Kemp's bass (Steeleye Span), was John Peel's favourite album of 1970. 'Survivor' featured the Chapman 'hit', 'Postcards of Scarborough', a characteristically tenderly sour song recounting the feelings of nostalgia and regret. Chapman is known as one of the UK’s best finger picking style guitar players. As part of a continuing musical lineage that includes the likes of Ralph McTell, John Martyn, Davey Graham & Bert Jansch, Chapman is still active touring and recording and his playing is on top form. There are regular releases of new recordings, (Fish – 2015) archive recordings (Live at Folk Cottage -2013) and reissues of his classics. 'Rainmaker’, Fully Qualified Survivor', ‘Wrecked Again’, ‘Window’ & ‘Playing the Guitar The Easy Way’ have been reissued by USA label Light in The Attic on CD and vinyl format as a complete reissue series of his early work on EMI’s Harvest label. Recent collaborations with Thurston Moore (Sonic Youth) and the American 'primitive school' of guitar players including the late John Fahey & Jack Rose, opened up a whole new audience of US based admirers. Appearing on recordings with Hiss Golden Messenger and Steve Gunn has cemented Chapman’s position as pivotal figure in roots, folk and acoustic guitar playing over the last 50 years. Mr. Chapman is an expert folk player just as liable to veer off into jazz, progressive, ragtime, hard rock or experimental directions. Wherever he goes Michael leaves his audience spellbound. With his guitar playing, his gravely voice and down to earth Yorkshire humour he builds an atmosphere that guarantees a brilliant evening of music and banter.